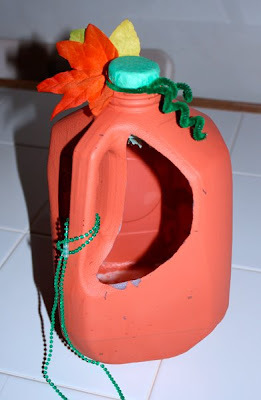 We did a craft a little while ago using plastic gallon milk jugs that I haven't blogged about yet (it's on it's way though), and we found ourselves with several left over jugs that friends had rescued from thier recycling for us. 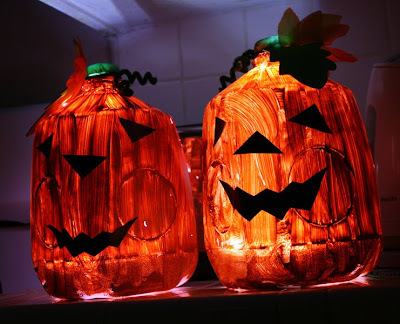 These, I thought, might make freaky looking Jack O lanterns. We painted up four of them because I had two of my little girl's friends over at the time. The kids used orange acrylic paint, which I was worried might be a bit harder than the usual kiddy paint to clean up, but it was ok and in the end it was lucky that we did because it looks like trick or treating is going to be a bit rainy tonight. 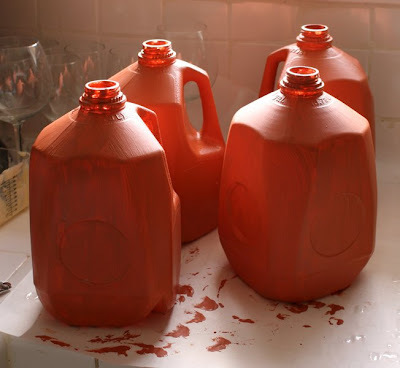 Once the milk jugs were dry I cut a hole in the back by the handle for the treats to go in and gave the kids some white glue and a load of random bits of stuff we had around to turn thm into jack o lanterns. 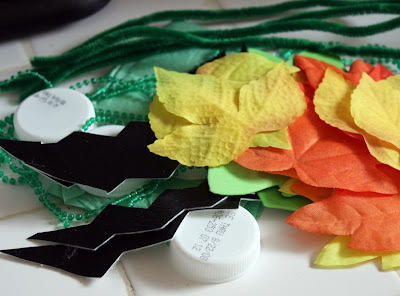 We had some green pipecleaners, some leaf shapes, I cut out from black eyes and mouths and some green tissue paper wrapped over the lids. They look kind of cool with torches in them too. 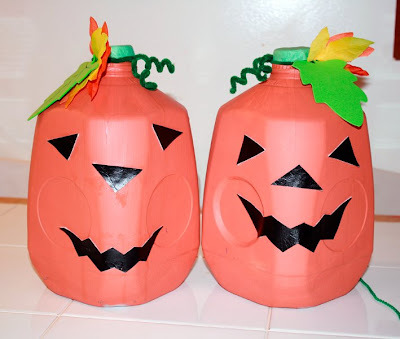 My girls used them this morning at thier preschool halloween parade and they are going to use them again tonight. Very spooky with the lights within! 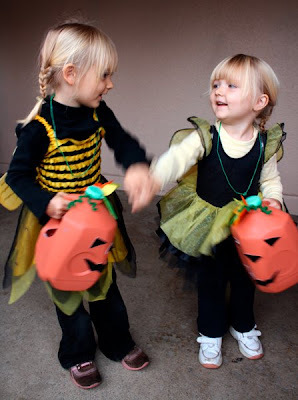 The girls costumes are adorable. Good project. Whoa...these are SO COOL! I love them! And the girls look adorable with them. Great job you guys, I'll be linking. Just found your blog through an e-mail from Parents.com. Made this with two 5yo's tonight and they came out great. Thanks so much for sharing! !